Mattel Goes Retro at 2013 San Diego Comic Con | Mattel Inc.
SAN DIEGO, Calif. – July 17, 2013 –Mattel, Inc. (NASDAQ:MAT) invites fans of all ages to celebrate retro-Americana with the biggest hits in pop-culture along with new-to-be classics Max Steel® and Monster High® at San Diego Comic-Con (SDCC). Stop by booth #3029 for on-sale blast-from-the past and first avail collectibles, giveaways and talent autograph sessions with WWE® Superstars and A-Team actors Dirk Benedict (Face) and Dwight Schultz (Murdoch). For the most current event schedule visit Mattycollector.com. Meet Max Steel! -- Mattel’s newest teenaged superhero Max Steel makes his first sensational SDCC debut. Fans will get to experience the world of Max Steel with an exclusive demo of the new mobile game, limited edition giveaways and a sneak peak of the graphic novel series. On Sunday Jul. 21st take part in the world premiere screening of the new TV season “Rise of Elementor” happening in room 7AB from noon to 1PM. Watch this exciting two-part broadcast event before it airs on Disney XD this fall. Help Mattel & Warner Bros Consumer Products Through Auction to Benefit Make-A-Wish® --Six one-of-a-kind DC Universe Paint Masters (9" to 14" tall) will be part of an online auction taking place at the Mattel booth to benefit Make-A-Wish America in 2013. Each hand-painted figure to be auctioned was a part of a 6" master collector toy line in the DC Universe. A must for DC collectors, this once in a lifetime opportunity will help grant wishes to kids with life-threatening medical conditions! The auction runs from July 17th at 6pm PST and runs through July 27th ending at 5:59pm PST and bids can be placed here online. “Man of Steel™” Quick Shots™ SDCC Launching Gallery --Taking place daily at the Mattel booth, fans can take aim and soar with Superman™! Launch the newest hot toy QuickShots™ in an immersive target shooting experience for a chance to win a coveted black suit Superman™ QuickShots™ figure—before it hits stores! Movie Masters® Epic Creations™-- See how Mattel brings the magic of the movies to life in toy form with this first-ever in-booth museum! The Movie Masters™ Epic Creations™ line delivers playsets, vehicles, cosplay accessories and more from some of the most popular entertainment properties of all time. Developed hand-in-hand with film and television studios, every Epic Creations™ product brings to life the superior detail, accurate articulation, and premier features adult collectors expect. For panel and autograph sessions visit booth # 3029 or www.Mattycollector.com for up-to-date schedules and details. Masters of the Universe® Classics Rokkon™ & Stonedar™ 2-Pack--The Comet Warriors have arrived! Sculpted by the Four Horsemen, this 2-pack of vintage MOTU Rockmen figures includes the young and excitable Rokkon™ and the wise and heroic Stonedar™. Masters of the Universe® Classics Mini He-Man® & Skeletor® Figures--At long last, the fan demanded mini versions of He-Man® and Skeletor®… in a foldout mini Castle Grayskull® diorama package! BATMAN™ Classic TV Series Batman™ Batusi Batman™--It’s the dance craze that swept the nation! For the first time ever, this Batusi Batman™ figure recreates the iconic dance from the BATMAN™ Classic TV series. Package features vintage-look art from Shag! 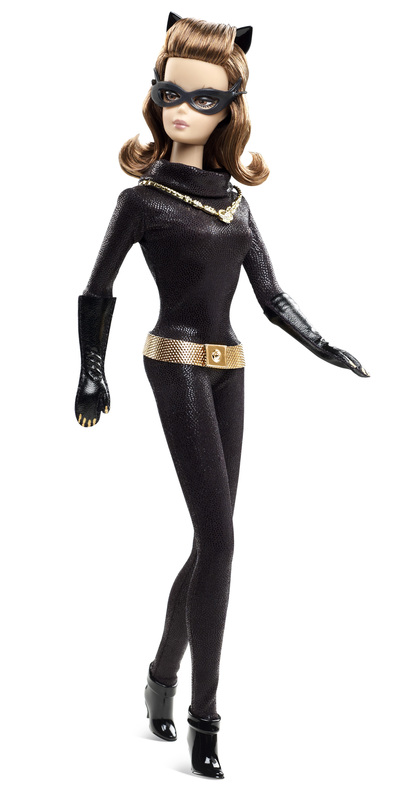 Catwoman Barbie® Doll--The Caped Crusader has met his match… the purr-fectly beguiling Catwoman! Now Barbie® doll takes on the role of this famous DC Comics character wearing a re-creation of the iconic BATMAN™ Classic TV Series costume, complete with mask and cat ears! Hot Wheels® Battlestar Galactica Cylon Raider Vehicle-- Celebrate the 35th Anniversary of the thrilling TV show with this 1:64 scale Battlestar Galactica Cylon Raider! Hot Wheels® Battlestar Galactica Colonial Viper Mark II Vehicle --You’ve waited for many yahrens… now you can celebrate the 35th Anniversary of the original 1978 TV show with this finely detailed replica Battlestar Galactica Colonial Viper Mark II Vehicle! Hot Wheels® A-Team Custom GMC® Panel Van-- We pity the fool who doesn’t snag this cool ride! An updated A-Team Custom GMC® Panel Van features “mud” deco added to the wheels, body, and window, and arrives housed in an ammo box-style package. Features include Real Riders® wheels and diecast body and chassis. Hot Wheels® Atari® Beach Bomb™ Pickup--You’ll be transported back to the local video arcade with the Hot Wheels® Atari® Beach Bomb™ Pickup, finished in Red Line Club level hand polished Chrome Spectraflame® and Asteroids deco! Monster High® Webarella™--This year’s anticipated Monster High offering is Wydowna Spider™, the silky smooth Daughter of Arachne, dressed in her costume as the Power Ghoul™ Webarella™! DC Man of Steel™ Movie Masters® Superman™ vs. General Zod Movie Pack--This 2-pack brings to life the super charged battle between two powerful Kryptonians, Superman™ and the General Zod, an exciting diorama set in the city of Metropolis! Mattel, Inc. is the worldwide leader in the design, manufacture and marketing of toys and family products. 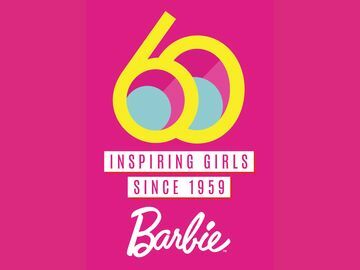 The Mattel family is comprised of such best-selling brands as Barbie®, the most popular fashion doll ever produced, Hot Wheels®, Monster High®, American Girl®, Thomas & Friends® and Fisher-Price® brands, including Little People® and Power Wheels®, as well as a wide array of entertainment-inspired toy lines. In 2013, Mattel was named as one of FORTUNE Magazine's "100 Best Companies to Work For" for the sixth year in a row and as one of the "World’s Most Ethical Companies" by Ethisphere Magazine. Mattel also is ranked No. 2 on Corporate Responsibility Magazine's "100 Best Corporate Citizens" list. With worldwide headquarters in El Segundo, Calif., Mattel employs approximately 30,000 people in 40 countries and territories and sells products in more than 150 nations. At Mattel, we are Creating the Future of Play. Visit us at www.mattel.com, www.facebook.com/mattel or www.twitter.com/mattel. 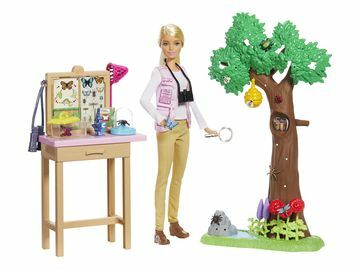 ©2013 Mattel, Inc. All Rights Reserved. Battlestar Galactica is a trademark and copyright of Universal Studios. Licensed by NBC Universal Television Consumer Products Group 2013. General Motors Trademarks used under license to Mattel, Inc.